Water damage comes in many forms, often as a result of faulty plumbing, appliance failures, or storm leaks. Time is crucial in these situations. Responding quickly can immediately begin reversing the damage. Turn off power to affected rooms/areas. Find and stop the source if possible. If it involves plumbing, turn off the water to the leaking fixture. Remove valuables from damaged areas. Our expert crew responds quickly, so by calling us first, you are already a step ahead. We have the right equipment to get you dried out quickly! More than just removing excess water, Arizona Construction and Restoration licensed full service contractors are experienced in build backs and rebuilds. 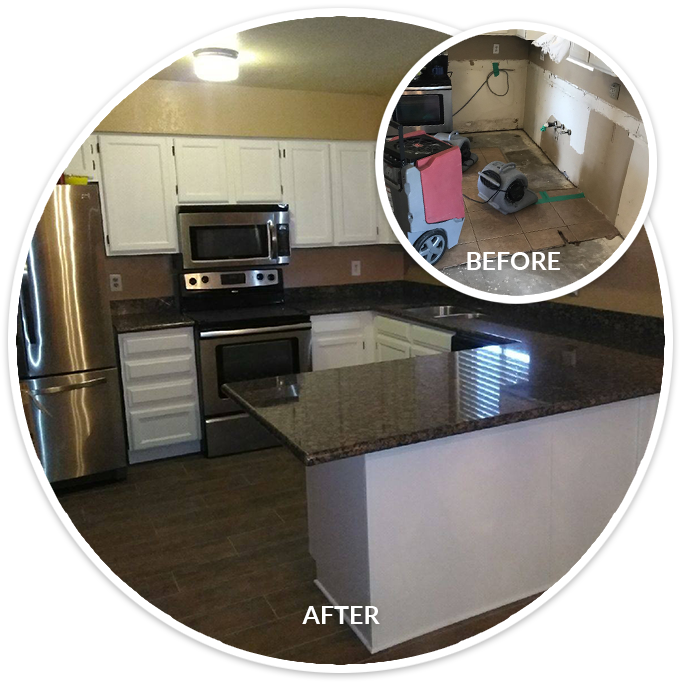 Image Pictured: Before and after a completed water extraction and rebuild of kitchen area from water damage. At Arizona Construction and Restoration we understand the many emotions and the overwhelming amount of information that a home disaster brings. Being a leader in the restoration business, we have heard many stories of homeowners who found themselves where you are now. 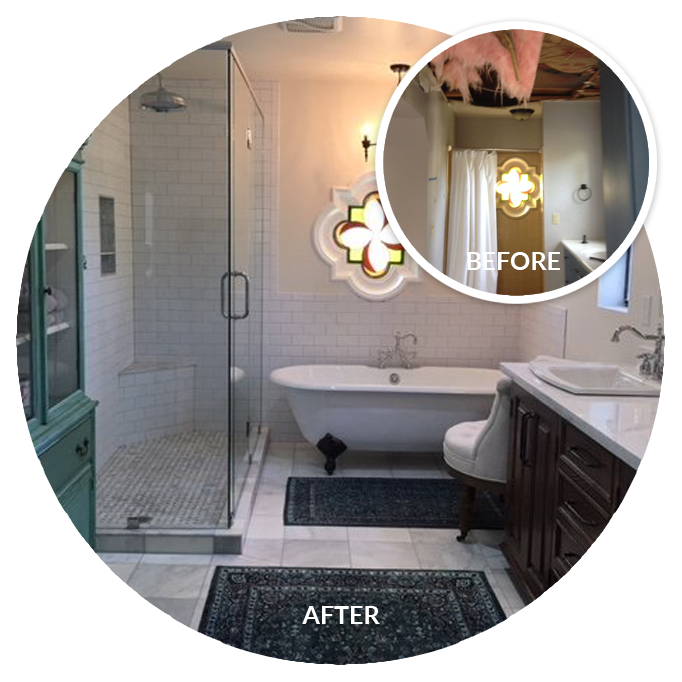 They speak of how they felt when their restoration company had left them with unanswered questions which made an already stressful situation, even more stressful. “We recently experienced a water loss in our home. We were frustrated and upset with the slow response and poor communication with all involved. It was often left to us to call and get information as to what was going on and what to expect next. I would describe it as a rollercoaster of emotions and frustrations throughout the whole process.” Judy C.
As your water mitigation contractor, we will be handling the drying out of your home. Our certified and trained technicians will document the water mitigation process with digital pictures, moisture readings, and written documentation, all of which will be forwarded to your insurance carrier. In order to mitigate or “dry out: your home, various techniques may be used. Some of which may include: extraction of water from flooring surfaces, removal of drywall, baseboards, carpet, cabinets, etc., placement of specialized equipment, and setting up of containment barriers. 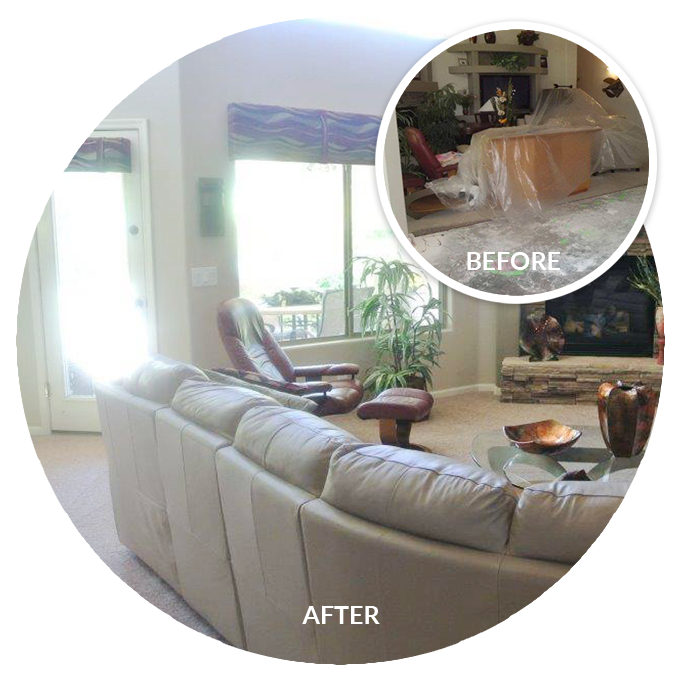 As every loss is unique, we will develop a plan of action customized to effectively dry out your home in the quickest and least invasive way possible. After your home has been determined to be dry, we will notify your insurance carrier the mitigation process has been completed. At that time your insurance carrier may refer a general contractor to come in and handle the reconstruction of your home. All questions or concerns NOT related to the mitigation work should be directed to either your home insurance carrier/agency or your general contractor. Our expert staff are certified to handle water and flooding disasters from start to finish.